Before going to Spain in an attempt to defend his Gibraltar titles (2008, 2015, 2016, 2017), GM Hikaru Nakamura traveled to South Africa for a visit and a series of exhibitions. 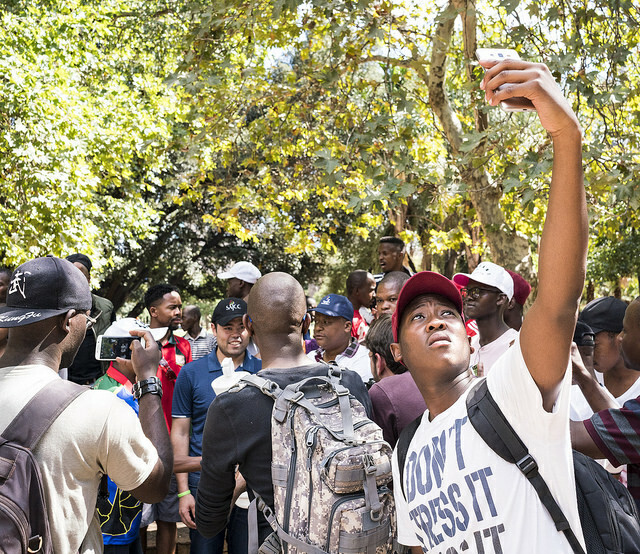 There were a number of videos buzzing around in social media and the visions of over-excited South Africans made it a must-see event. Nakamura arrived in Johannesburg the morning of January 3rd and in the evening played the final of the 2017 Speed Chess Championship Final against World Champion Magnus Carlsen. What great timing! 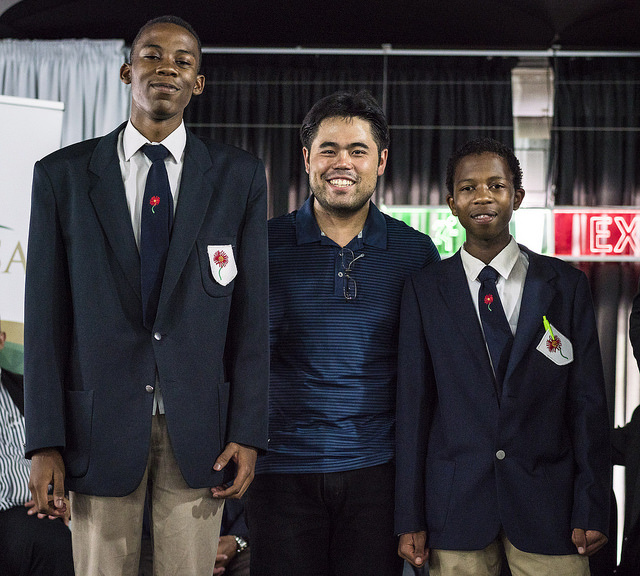 Nakamura was in South Africa as part of a week-long whirlwind tour featuring a variety of events… most notably the 2017 South African Junior Chess Championships. He is one of few top-level GMs to have touched African soil, a sad reality. Hikaru Nakamura at simul before the South African Junior Championships. Nakamura faced 101 players and go 92 wins, 7 draws and 2 losses! Nakamura did visit Libya for the 2004 FIDE Knockout, but had not ventured to the Sub-Saharan African region. Of course, Maurice Ashley and Pontus Carlsson have recently visited the continent to participate in an “Chess Masters for African Tour,” but Viswanathan Anand (Botswana, Tanzania, Kenya, South Africa), Judit Polgar (Botswana) and Nigel Short (Kenya, Uganda, Tanzania, Nigeria to name a few) are a few of the top-10 GMs (past and present) who have ventured to the continent… especially south of the Sahara. 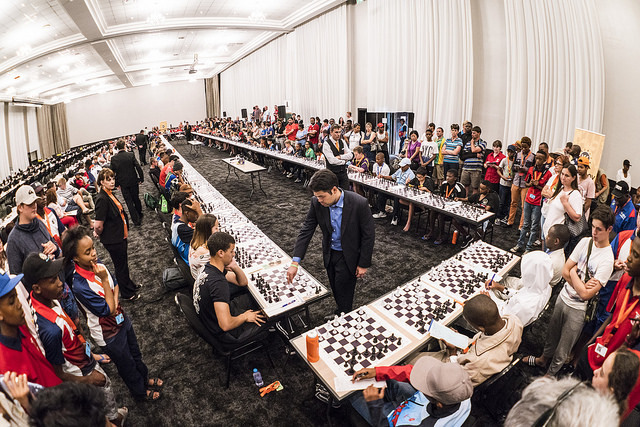 Despite being a continent needing the most assistance to propel chess development, Africa has received little attention from FIDE officials and struggles to gain the attention of local officials. Ironically, it becomes a battleground every four years during the FIDE elections. Thus far, things are quiet politically. Nevertheless, the arrival of a top Grandmaster is always a jolt of adrenaline and Nakamura’s appearance was no exception. Nakamura has developed into one of the biggest brands in the chess world. He makes himself accessible to fans and seems to be willing to accept almost any online challenge. His chess.com banter and Twitch videos are ever-popular and his style never disappoints. However, his South African trip was not only a community service appearance and a vacation, but it turned out to be much more activity than we could imagine. There was even a session of blitz lawn chess! Large crowd came out to Joubert Park! 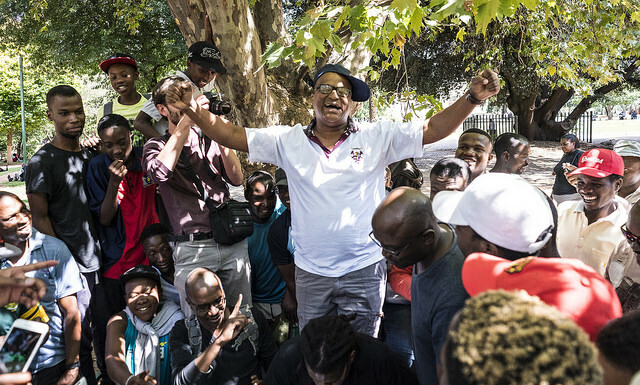 He found himself in the famous Joubert Park where he faced off against all comers including IM Johannes Mabusela. 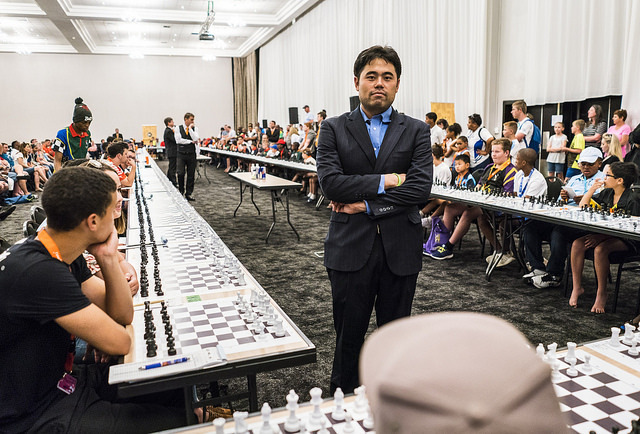 The scene was electric and the American Grandmaster seemed to enjoy the moment. Here is one battle giving opponent 3:1 time odds and 10:1 money odds. Of course, the money wasn’t the issue, but it certainly upped the pressure on the four-time American champion. Check this out! What is the significance of a set of blitz games? Certainly, blitz is a common pastime in the chess world and a staple of chess in the park. What is amazing is NOT the fact that a Grandmaster is playing in the park, but it happens to be one of the top players in the world. 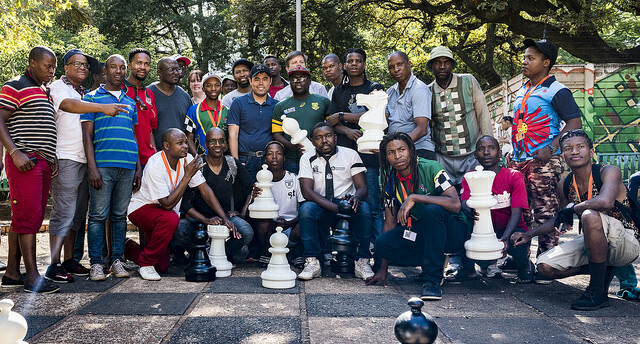 It would still be news if Nakamura showed up in Washington Square Park, but to bring such excitement to the South African community is enough to provide an impetus for chess development. Few of the top players make these type of appearances, but if they knew the impact these visits could have, many may venture to Africa more often. Mikhail Botvinnik would no doubt be horrified at Nakamura playing blitz in a park against random players, but the beauty is that chess gains a new level of respect and prestige. …and even got a game in (see game). What can we gather from this exhibition? We saw the enthusiasm throughout the visit during the simul, the ceremonies and even in the park. 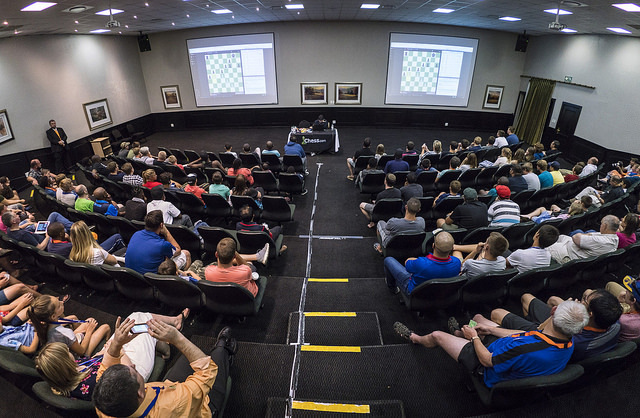 Players in South Africa have a lot of passion for chess and it’s quite a boost when you have the world’s strongest players to visit. It helps the marketability of chess and also provides prospects for future events. I have also stated that the best chance for African players to earn FIDE titles is to attract professional players to the continent. It’s fine for strong players to come and give lectures and simuls, but the idea of hosting strong tournaments on the continent would provide such a catalyst for growth. Traveling abroad is cost-prohibitive for many non-professional African players, and there are few opportunities on the vast continent. 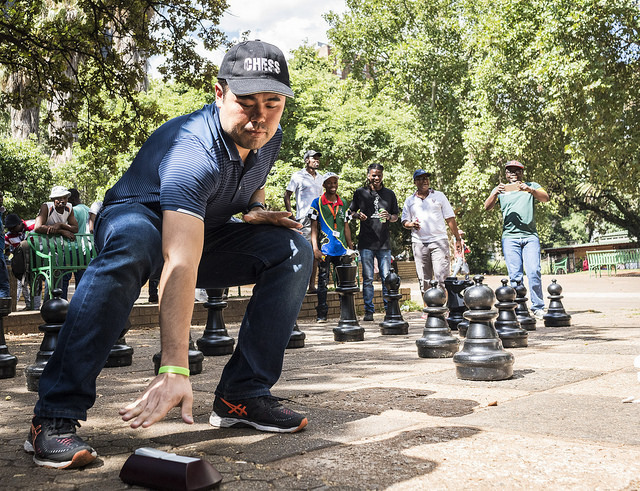 Seeing Nakamura playing in South African parks give chess a bit more accessibility that the top-level tournaments don’t provide. Here we saw the many faces of chess: online championship chess, scholastic chess and park chess. Fortunately, there are organizations making a push for chess development and Kasparov Chess Foundation for Africa (KCFA) continues to make a strong presence. Thanks to Graham Jurgensen of KCFA and the organizing committee for making this happen! Great day at Joubert Park!